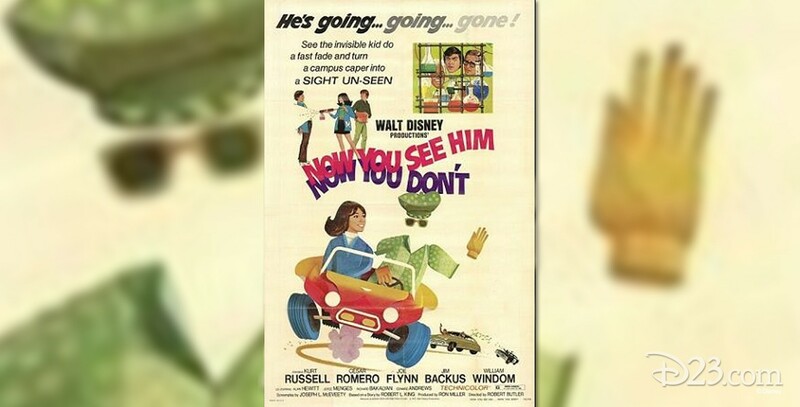 Now You See Him, Now You Don’t (film) At Medfield College, Dexter Riley comes up with a lab experiment that produces fantastic results—invisibility! But the magic potion is stolen and is put to use by a bank robber. Nevertheless, Dexter and his pals foil the robbers and recover the potion, which wins an award and saves Medfield from financial ruin and being transformed into a gambling mecca. Premiere in Edmonton, Canada on July 7, 1972; general release on July 12, 1972. Directed by Robert Butler. 88 min. Stars Kurt Russell (Dexter), Joyce Menges (Debbie Dawson), Joe Flynn (Dean Higgins), Cesar Romero (A.J. Arno), William Windom (Lufkin), Jim Backus (Forsythe). Released on video in 1985.